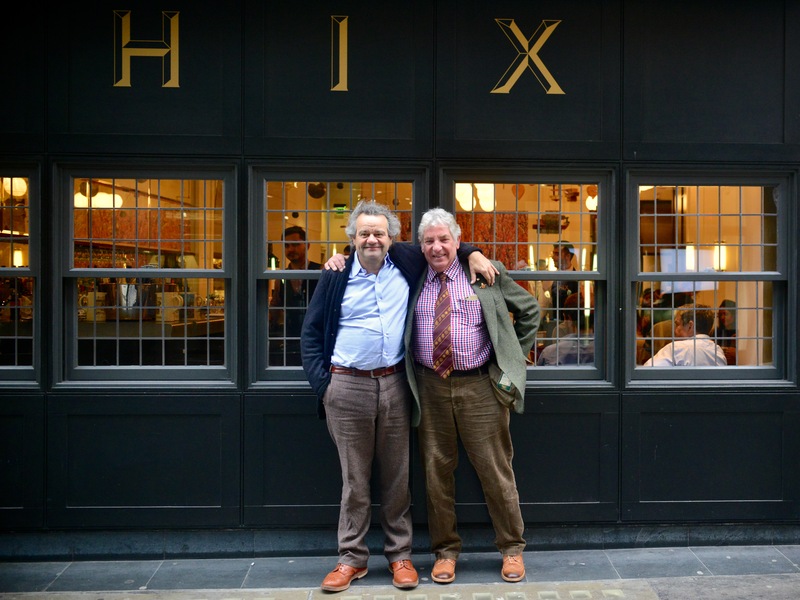 Mark Hix’s quest for traditional British farm produce led him to Peter Gott’s stall in Borough Market where he was introduced to pork from Peter’s wild boar who spend their lives rooting and grubbing in mixed woodland above the farmhouse. The taste was a revelation, and Peter has been supplying Mark’s expanding chain of restaurants for the past fifteen years. We started our filming in the kitchen/ library at Mark Hix’s Tramshed Restaurant one Monday morning when he challenged the assembled chefs, gathered from his restaurant chain, to create new pork dishes for menus for the weeks ahead. By the end of the session there were delicious dishes from every part of the pig, including trotters, brain, liver and stomach, normally classed as offal and thrown away or made into pet food. A few weeks later in the early autumn we found Peter at his stall in Kendall Market where he was offering samples of spicy scotch eggs filled with wild boar black pudding, and doing a brisk trade in fresh pork cuts, sausages, pork pies, black pudding and bacon. As a second generation producer, he is a firm believer in the Slow Food movement that promotes the cultural diversity of local artisan produce that provides so many distinctive regional products around the world. When the market closed he took us to the wood above his farmhouse where we met, or rather stayed clear of Sid, a huge silverback boar with ferocious looking tusks who had sired several litters of piglets that were already turning over dead branches and stones in their search for the wide variety of roots and grubs that give such strong and complex flavour to their meat. That’s something we should be aware of and appreciate. In the UK 40% of the sows are outside all their lives, contrasting with 5% in Germany and 2% in Denmark. In the USA outdoor pig farming is almost extinct, so that Chipotle, a US fast food chain specialising in high welfare and ethical produce, has to source its high welfare pork from UK farms.